Danelectro "Special" Model Tube Amplifier, c. 1952, made in Red Bank, NJ, brown fabric covering finish. Great sounding early Danelectro amp, marked "SPECIAL Instrument Amplifier With Vibrato". 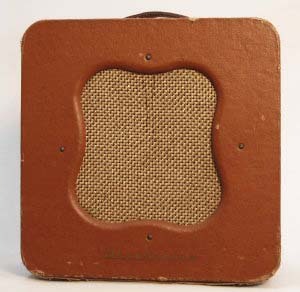 Three inputs, 4 brown Bakelite radio-style knobs for tone, volume, and vibrato speed and depth. Rounded corner nearly square cabinet with vaguely clover-like speaker hole, covered in what looks very much like the same material as Gibson's 1950's brown cases. Gold Danelectro logo at bottom front. Controls in rear, tubes mounted above chassis, nice complement of old Sylvania's and RCA's. Speaker carries 1952 date code. Complete with hardwired vibrato pedal, this amp would be serious competition for a tweed Deluxe! Height is 17 1/4 in. (43.8 cm. ), 17 in. (43.2 cm.) width, and 8 1/4 in. (21 cm.) deep. Just serviced; original except repro leather handle. Some wear to covering on edges, light staining. Works great and sounds fantastic! Excellent Condition.